Holly Miller is stuck in a dead-end job and lives in a run-down apartment in New York City. While she seems to live alone, in reality Holly lives with “The Committee,” the five different personalities that make up her Dissociative Identity Disorder (DID). Residing in the Holly’s head are the faceless Boy in the red Converse; the ancient meditating Silent One; Sarge, who keeps her safe; whale-size Ruffles, the chip eater; and Betty Jane, the Southern belle. When flirtatious Betty Jane lands Holly a job as a cartoon voice-over artist, her life appears to stabilize and she is finally able to support herself. However, when the directors want to make Ruffles the star of the show, all hell breaks loose. 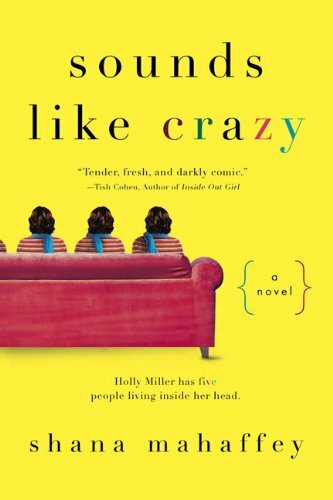 The second half of Sounds Like Crazy is the strongest, as Holly focuses on her therapy, and layer after layer is pulled away to reveal the events that led to Holly’s development of DID. The pace of the novel slows, Mahaffey’s writing style becomes clear and concise as she delves into a subject that clearly fascinates her: How the human mind works. While her narration is evocative (“…the familiar rattle of a Volkswagen Beetle…that sounded like a bag of rocks and sand shaking…”), the character of Holly remains quite undefined for a novel of this length (400 pages). The comedic tone in the first section of Sounds Like Crazy is completely opposite to the rest of the book, so much so that one is led to suggest the book has multiple personalities. This attempt at levity and slapstick detracts from the strong voice that resounds from the second section. Like many debut novelist, Mahaffey tries to do too much in one novel, and ultimately this detracts from the power of Holly’s story. If Mahaffey focuses her writing on other topics that interest her as much as the human mind, she should enjoy success as a novelist.